Courtesy photo Ketchum resident Jane Letourneau, left, with Mathapelo Ngaka, one of the three founders of Monkeybiz. Ketchum resident Jane Letourneau has organized the sale through her work as director of global programs for Open Arms, a nonprofit organization based in Minneapolis, Minn., that provides nutritious food for people living with potentially life-threatening diseases. In sub-Saharan Africa, Letourneau's work with Open Arms concentrates on providing services to people living with HIV/AIDS and frequently takes her there. She will attend the show at Gilman Contemporary to talk about the beaded art and her work in Africa. Women who live in the townships located outside of Cape Town, South Africa, are the artists who create work for Monkeybiz, an internationally known and award-winning women's empowerment project there. The women earn enough money from the sale of their art to meet basic needs such as food, shelter and uniforms for children to attend school. 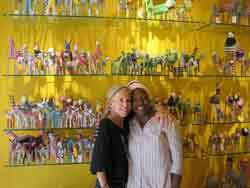 The beaded artwork to be sold at Gilman Contemporay includes animals and dolls, all handmade from colorful, glass beads. The works range from $45 to $1,500 in cost and from 4 inches to 3 feet high in size. Monekybiz artwork is featured at galleries and boutiques throughout the world, including Sotheby's, Christie's and ABC Carpet. In addition, celebrities such as Annie Lennox, Donna Karan and Halle Berry collect Monkeybiz. For more information on Monkeybiz, visit www.monkeybiz.co.za and for additional information on Open Arms, visit www.openarmsmn.org.